2. Or Saa’ah kubraa (the greater Hour), which is when mankind will be resurrected from their graves to be judged and rewarded or punished accordingly. 2. Umm Salamah (may Allaah be pleased with her) said: “I heard the Messenger of Allaah (peace and blessings of Allaah be upon him) say: ‘The Mahdi will be of my family (according to one report: of the people of my household) [Reported by Ibn Hibbaan and by al-Haakim in al-Mustadrak. He said: this hadeeth is saheeh according to the conditions of the two shaykhs, but they did not report it. Al-Dhahabi agreed with him] from the children of Faatimah.” [Reported by Abu Dawood, 11/373 and Ibn Maajah, 2/1368. Classed as saheeh by al-Albaani in Saheeh al-Jaami’, section 6610]. Al-‘Allaamah al-Safaareeni said: “So many reports were narrated concerning the appearance of the Mahdi that they reached the level of Tawaatur in meaning, and this became so well known among the scholars of Sunnah that it is counted as one of their basic beliefs.” (Lawaami’ al-Anwaar al-Bahiyyah, 2/84). [Tawaatur: a mutawaatir hadeeth is one that was narrated by so many people and transmitted by so many people that it is inconceivable that they could all have agreed on a lie. Translator] Imaam al-Shawkaani said: “The mutawaatir ahaadeeth about the awaited Mahdi, which we managed to find and examine, number fifty, including saheeh, hasan and da’eef munjabir (weak ahaadeeth that are supported by corroborating evidence) reports. They are mutawaatir beyond any shadow of a doubt… The reports from the Sahaabah that speak about the Mahdi are also very many and are judged as having the status of marfoo’ ahaadeeth (i.e., ahaadeeth whose isnaads go back to the Prophet (peace and blessings of Allaah be upon him), because this is not an issue in which they would have made ijtihaad.” (For more information, see Question #1252). 3. ‘Imraan ibn Husayn (may Allaah be pleased with him) said: “I heard the Messenger of Allaah (peace and blessings of Allaah be upon him) say: “Between the creation of Aadam and the onset of the Day of Judgement, there will be a creation greater than the Dajjaal.” (Reported by Muslim, 18/86). [This means that] the Dajjaal will appear from the East, from Khurasaan, from among the Jews of Isfahaan, then he will travel around the world, leaving no country but he will enter it, except for Makkah and Madeenah, which he will not be able to enter because the angels are guarding them, as is reported in the hadeeth of Abu Bakr al-Siddeeq (may Allaah be pleased with him): “The Messenger of Allaah (peace and blessings of Allaah be upon him) told us that the Dajjaal would appear from a land in the East called Khurasaan.” (Reported by al-Tirmidhi, 6/495); classed as saheeh by al-Albaani in Saheeh al-Jaami’, section 3398). The fitnah (trial, tribulation) of the Dajjaal will be the greatest fitnah ever, seen from the time that Allaah created Aadam until the onset of the Day of Judgement, and this will be because of the power that Allaah will permit him to have, of working great miracles that will amaze and confuse the people. There are ahaadeeth that describe how he will have a “paradise” and a “hell”, but his paradise will in fact be a hell, and vice versa. He will have rivers of water and mountains of bread. He will command the sky to rain, and it will rain, and he will command the earth to bring forth its produce, and it will bring forth its produce. The treasures of the earth will follow him, and he will travel though the earth at great speed, like rain driven by the wind. The Prophet (peace and blessings of Allaah be upon him) taught his ummah how they can protect themselves from the evil of the fitnah of the Dajjaal, as is reported in the hadeeth of Abu Hurayrah, may Allaah be pleased with him, who said that the Messenger of Allaah (peace and blessings of Allaah be upon him) said: “When any one of you pronounces the Shahaadah, let him seek refuge with Allaah from four things, and let him say: ‘Allaahumma innee a’oodhu bika min ‘adhaab jahannam, wa min ‘adhaab al-qabr, wa min fitnati’l-mahyaa wa’l-mamaat, wa min sharri fitnati’l-maseeh al-dajjaal (O Allaah, I seek refuge with You from the punishment of Hell, from the punishment of the grave, from the trials of life and death, and from the evil of the tribulation of the Dajjaal).” (Reported by Muslim, 5/87). Another way of protecting oneself is by memorizing the first aayaat of Soorat al-Kahf. The Prophet (peace and blessings of Allaah be upon him) enjoined reciting the first verses of Soorat al-Kahf against the Dajjaal, by reciting the first ten verses, as was reported by al-Nawwaas ibn Sam’aan, who said that the Prophet (peace and blessings of Allaah be upon him) said: “Whoever of you encounters him (the Dajjaal), let him recite the first verses of Soorat al-Kahf against him.” (Reported by Muslim, 18/65). Abu’l-Dardaa’ (may Allaah be pleased with him) reported that the Prophet (peace and blessings of Allaah be upon him) said: “Whoever memorizes ten aayaat from the beginning of Soorat al-Kahf will be protected from the Dajjaal.” (Reported by Muslim, 6/92). The destruction of the will come at the hands of ‘Eesaa ibn Maryam, upon whom be peace, as is indicated in the saheeh ahaadeeth. ‘Abd-Allaah ibn ‘Amr (may Allaah be pleased with them both) said: “The Messenger of Allaah (peace and blessings of Allaah be upon him) said: ‘The Dajjaal will emerge among my ummah… and Allaah will send ‘Eesaa ibn Maryam… and he will pursue him and destroy him.” (Reported by Muslim, 18/75). After the Dajjaal has appeared and spread corruption throughout the earth, Allaah will send ‘Eesaa ibn Maryam, upon whom be peace, who will descend to the earth, coming down to the white minaret in the East of Damascus, Syria, resting his hands on the wings of two angels. When he lowers his head, drops will fall, and when he raises it, drops like large pearls will fall (these are like grains of silver in the shape of big pearls, and it means that drops of water as pure as pearls will fall. The water is described as pearls because of its purity). No kaafir will smell his breath except he will die, and his breath will reach as far as his eyes can see. He will come down to the victorious group that is fighting for the truth and has come together to fight the Dajjaal. He will descend at the time when the iqaamah for prayer is being given, and he will pray behind the leader of that group. 1. Abu Hurayrah (may Allaah be pleased with him) reported that the Prophet (peace and blessings of Allaah be upon him) said: “By the One in Whose hand is my soul, it is nearly time for the son of Maryam to descend upon you, to judge fairly. He will break the cross, kill the pigs and put an end to war. Wealth will increase so much that no-one will accept it, and one prostration to Allaah will be worth more than the world and all that is in it.” Then Abu Hurayrah said: “Recite, if you wish: ‘And there is none of the people of the Scripture (Jews and Christians) but must believe in him (‘Eesaa – as a human Messenger of Allaah) before his (‘Eesaa’s) death. And on the Day of Resurrection, he (‘Eesaa) will be a witness against them.” [Al-Nisaa’ 3:159 – interpretation of the meaning]. '” (Reported by al-Bukhaari, 6/490, and Muslim, 2/189). 2. Abu Hurayrah (may Allaah be pleased with him) also reported that the Prophet (peace and blessings of Allaah be upon him) said: “How will you be when ‘Eesaa ibn Maryam descends to you and your leader is one of you?” (Reported by al-Bukhaari, 6/491, and Muslim, 2/193). Ya’jooj and Ma’jooj are human beings, descended from Aadam and Hawwa, upon whom be peace. According to the descriptions of them given in the ahaadeeth, they belong to the Turkic Mongol race, having small eyes, small, flat noses and wide faces. Their faces look like hammered-out shields (their faces are likened to shields because they are wide and round). 1. Umm Habeebah bint Abi Sufyaan reported from Zaynab bint Jahsh that the Messenger of Allaah (peace and blessings of Allaah be upon him) entered upon her one day in a nervous state, saying, “La ilaaha ill-Allaah! Woe to the Arabs from the evil that has approached! Today a hole this big has appeared in the barrier of Ya’jooj and Ma’jooj,” and he made a circle with his thumb and forefinger. Zaynab bint Jahsh said, “O Messenger of Allaah, will we be destroyed even though there are righteous people among us?” He said, “Yes, if evil becomes widespread.” (Reported by al-Bukhaari, 6/381, Muslim, 18/2). 2. 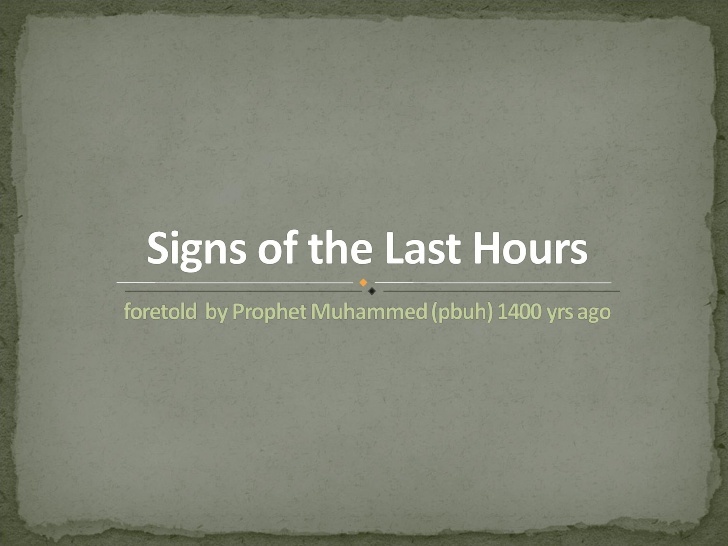 Al-Nawaas ibn Sam’aan (may Allaah be pleased with him) reported a long hadeeth describing several signs of the Hour. In this hadeeth, the Prophet (peace and blessings of Allaah be upon him) said: “… and Allaah will send Ya’jooj and Ma’jooj, swiftly swarming from every mound. They will pass the lake of Tiberias [in Palestine] and will drink everything that is in it. Then the last of them will pass by and will say, ‘There used to be water here once.’ The Prophet of Allaah, ‘Eesaa, and his companions, will be besieged until a bull’s head will be more precious to one of them than a hundred dinars are to any of you today. ‘Eesaa and his companions will pray to Allaah, and Allaah will send a kind of worm (like that found in the noses of camels and sheep) on their (Ya’jooj and Ma’jooj) necks, and they will fall down dead, all at once. Then ‘Eesaa and his companions will come down out of the place where they were besieged, and they will find hardly a handspan of land that is not filled with the stench (of Ya’jooj and Ma’jooj), so ‘Eesaa and his companions will pray to Allaah, and He will send birds like the necks of camels to carry them away and throw them wherever Allaah wills.” (Reported by Muslim, 18/68). This means that a place is swallowed up in the earth and disappears into it, as is described in the Qur’aan (interpretation of the meaning): “So We caused the earth to swallow him and his dwelling place…” [al-Qasas 28:81]. Among the major signs of the Hour will be three such events, as described in the hadeeth of Hudhayfah ibn Usayd (may Allaah be pleased with him), according to which the Messenger of Allaah (peace and blessings of Allaah be upon him) said: “The Hour will not begin until you see ten signs… (including) three events where the earth swallows up, one in the East, one in the West, and one in the Arabian Peninsula.” (Reported by Muslim, 18/27). These events, like other major signs of the Hour, have not happened yet. Although other instances of places being swallowed up by the earth have occurred at various times and in various places, they did not cover so wide an area as to include both East and West. Al-Haafiz Ibn Hajar (may Allaah have mercy on him) said: “There have been instances of places being swallowed up by the ear, but it could be that what is meant by the three events referred to is events that are worse than anything yet seen, which could be more intense and cover a larger area.” (Fath al-Baari, 13/84). Imaam Ibn Katheer commented: “This is a saheeh isnaad, going back to Ibn ‘Abbaas, the scholar of the ummah and the interpreter of the Qur’aan. This is also the opinion of all the Sahaabah and Taabi’een who agreed with him, in addition, there are many ahaadeeth going back to the Prophet (peace and blessings of Allaah be upon him) – saheeh, hasan and others – which state the same thing. This is convincing evidence that the smoke will be one of the expected signs, as is also clear from the text of the Qur’aan.” (Tafseer Ibn Katheer, 7/235). 1. The hadeeth of Abu Hurayrah (may Allaah be pleased with him) according to which the Messenger of Allaah (peace and blessings of Allaah be upon him) said: “The Hour will not begin until the sun rises from the West, and when it rises and the people see it, they will all believe, but that will be when it will do a person no good to believe, if he believed not before, nor earned good (by performing deeds of righteousness) through his faith.” (Reported by al-Bukhaari, 11/352, and Muslim, 2/194). 2. The hadeeth of ‘Abd-Allaah ibn ‘Amr ibn al-‘Aas (may Allaah be pleased with them both), who said: “I learned from the Messenger of Allaah (peace and blessings of Allaah be upon him) a hadeeth that I have never forgotten since. I heard the Messenger of Allaah (peace and blessings of Allaah be upon him) say: ‘The first of the signs of the Hour to appear will be the rising of the sun from the West. '” (Reported by Muslim, 18/78). Allaah says (interpretation of the meaning): “And when the Word (of torment) is fulfilled against them, We shall bring out from the earth a beast to them, which will speak to them because mankind believed not with certainty in our aayaat.” [al-Naml 27:82] Abu Hurayrah (may Allaah be pleased with him) said: “The Messenger of Allaah (peace and blessings of Allaah be upon him) said: ‘There are three things which, once they happen, it will do a person no good to believe, if he believed not before, nor earned good (by performing deeds of righteousness) through his faith: the rising of the sun from the West, the Dajjaal, and the Beast of the earth. '” (Reported by Muslim, 2/195). Abu Umaamah (may Allaah be pleased with him) reported that the Prophet (peace and blessings of Allaah be upon him) said: “The Beast will emerge, and it will mark all the people on their noses, and this mark will last, so that if a man buys a camel, and is asked who he bought it from, he will say, ‘From the man with the mark on his nose. '” (Reported by Ahmad and classed as saheeh by al-Albaani in al-Silsilah al-Saheehah, no. 322). The Qur’aan tells us that the Beast will speak to people, as Allaah says (interpretation of the meaning): “And when the Word (of torment) is fulfilled against them, We shall bring out from the earth a beast to them, which will speak to them because mankind believed not with certainty in our aayaat.” [al-Naml 27:82]. This kalaam may refer to actual speech, whereby the Beast will address people, which is supported by the reading of Ubayy ibn Ka’b (tunabbi’uhum, i.e., tell them), or it may convey the other meaning of the word kalaam, to wound, which is supported by the alternative reading (taklamuhum, i.e., mark them by cutting them) reported from Ibn ‘Abbaas (may Allaah be pleased with him). 1. The hadeeth of Hudhayfah ibn Usayd which mentions the major signs of the Hour, in which the Prophet (peace and blessings of Allaah be upon him) said: “… The last of them will be a fire which will emerge from Yemen, and will drive the people to their gathering place.” According to another report: “… and a fire which will emerge from the bottom of ‘Aden and drive the people (ahead of it).” (Reported by Muslim, 18/27). 2. The hadeeth of Anas (may Allaah be pleased with him) which states that when ‘Abd-Allaah ibn Salaam embraced Islam, he asked the Prophet (peace and blessings of Allaah be upon him) about a number of issues, including the first sign of the Hour. The Prophet (peace and blessings of Allaah be upon him) said: “The first sign of the Hour will be a fire which will drive the people from East to West.” (Reported by al-Bukhaari, 6/362). 3. Ibn ‘Umar (may Allaah be pleased with them both) said: “The Messenger of Allaah (peace and blessings of Allaah be upon him) said: ‘Fire will emerge from Hadramawt or from the sea of Hadramawt (according to another report: from the direction of Hadramawt or from Hadramawt – Mishkaat al-Masaabeeh) before the Day of Judgement, and it will drive the people (ahead of it). '” (Reported by Ahmad, 7/133; classed as saheeh by al-Albaani in Saheeh al-Jaami’, 3603). A number of saheeh ahaadeeth describe how this fire will gather the people together. Abu Hurayrah (may Allaah be pleased with him) reported that the Prophet (peace and blessings of Allaah be upon him) said: “The people will be gathered in three ways, willingly or by force, two on one camel, or three or four or even ten on one camel. The rest of them will be gathered together by means of a fire, which will stay with them whenever they stop to rest or to sleep, no matter what the time of day or night.” (Reported by al-Bukhaari, 11/377, Muslim, 17/194).